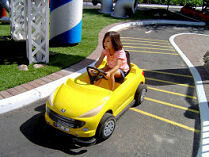 The Peugeot 207 Driving School has recently achieved the status of most popular children's ride at Alton Towers. The attraction, which was installed in mid-2006, has averaged a satisfaction score of 9.5 out of 10 from younger guests who have been on it. The 'drivers' were asked by staff to rate the Driving School, and give their opinion on the best and worst aspects of it. The most popular part of the ride was the Bubble Car Wash section, according to more than a third of those questioned. The Director of Public Relations at Peugeot, Andrew Didlick, said, "Visitors to this ride are Peugeot drivers of the future and we think it's important to give as many children as possible the opportunity to experience driving situations at an early age. "Many young people can't wait to get out in their own car, and by teaching them the basic Highway Code through the ride we are enforcing the need for driver and pedestrian safety." Russell Barnes, Alton Towers' Managing Director, was recently interviewed in FHM and he said, "[The Driving School] only cost £600,000, so you don't always need to spend big bucks. You just need to be imaginative." Get to the park before 10am to beat up the crowds.